Italian genetic research is in good health: this week I’m at a meeting held in the Cittadella in Assisi with about 500 people and 300 posters. The conferees reflect my own research interest with respect to species: about 80% of the work was on plants, and 80% of that work on crops, making a good start. The posters were all in English, as were the slides, but almost all the talks were in Italian, proving an unusual challenge. Nevertheless, my command of Italian is improving, and I am now fluent with Italian phrases such as “loss of function mutanti” and “next generation sequencing risultati”. The three Genetics Societies in Italy – AGI, SIBV and SIGA – put together a programme that nicely flagged the research going on in the country with strong international-level programmes. It was great that many of the top geneticists took part in the meeting, including Roberto Tuberosa, Michele Morgante, Antonio Blanco, Giovanni Giuliano, Roberto Papa or Mariano Rocci, to name just a few from my area. Even better, many only played a supporting role to key laboratory members who showed their own dedication and hard work in their results! This was much appreciated by the strong student representation, many of whom presented their first work at this meeting with its informal and supportive ethos. Not least because of my general familiarity with the work presented and its background (making the language of presentation less of a problem for me), it was particularly valuable to hear the Italian students and post-docs focusing on their contributions to major European and international projects, whether in whole genome sequencing, annotation and functional analysis, or in crop physiology, or animal genetics. The Organizers juggled the difficulty of breadth of coverage with keeping the meeting short and focussed nicely, with plenary and mostly only two parallel sessions. Major sessions were on topical issues such as epigenetics and epigenomics, then genome plasticity, moving on to systems biology. Sadly though, despite coverage of so many crops of special importance in Italy and the involvement of the agricultural genetics society, I failed to notice substantial contributions to discussions or presentations from breeders or seed organizations, the end users of so much of the research discussed. At a couple of recent conferences, I have helped writing a slightly more balanced report of many talks through Twitter. I’m not going to give any overview of the meeting here – the abstracts are of course helpful – but I can just point to a few pieces of work which I will certainly be discussing with my lab. Next week. It was very exciting to hear and consider the consequences of modern genetic work for the crops of particular importance in Italy: a systematic analysis of transcriptomics through three wine vintages in three different regions, all with same grape variety, Corvina, demonstrated how modern biology is addressing long-standing questions about genotype x environment interactions, agronomy and food production (Dal Santo et al.). Genes involved in transcriptome plasticity can be assigned to vineyards with different agronomic classes and plastic transcriptional drifts impacted metabolic rearrangements depending on microenvironment and growing conditions. 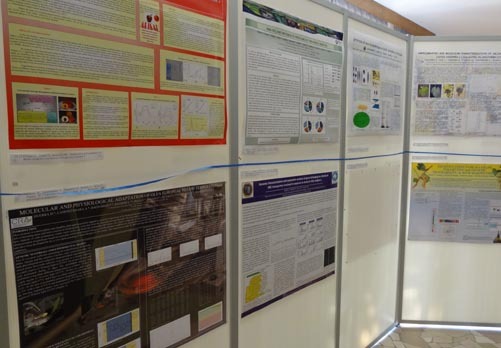 Several posters addressed the genetics and diversity of Tuber magnatum, the white truffle, and one was even using mitochondrial DNA fingerprinting to identify the oils in paints used by the Renaissance artists of Italy. The next area of genetics research – integrating systems – was well-covered, with A Vigilante showing network analysis approaches for identifying gene associations or functions, and understanding consequences of genome duplication. I was really pleased to have been part of this meeting, and to have so many valuable discussions. I have a substantial list of people where I want to continue discussions – ranging from needs for cytogenetic textbooks, to systems biology, to alien gene transfer. I hope some of the discussions we had will lead to visits to my lab for periods of joint research too. Of course, the beautiful environment of the Cittadella in Assisi was ideal for the meeting. We could mediate on the impact of genetics in the shadow of St Francis and world’s finest renaissance frescoes, in a small enough venue (the conference represented nearly 15% of the total population of the town) that demanding meditation (translating words of the Cittadella website) was in the framework of informal discussions of molecular genetics. awesome blog, do you have twitter or facebook? i will bookmark this page thanks. Thanks you, you can find all information on twitter in the next link http://twitter.com/#!/francfue It would be great if you join in the blog as follower. ;) I'm going to return once again since I book-marked it. Your style is so unique compared to other folks I've read stuff from. else may just anybody get that kind of information in such a perfect method of writing? Learned Society acts to support and promote research and teaching of genetics in england. It covers the analysis of genomes, genes and gene activity, and embraces scales ranging on the molecular and cellular to the people and ecosystem level. We work a pair of technological gatherings a year, and supply money regarding undergrad summer season tasks, fieldwork, coaching, consultant fascination teams, technological achieving company, discussion attendance and take a trip. All of us additionally merit numerous named Medals and Treasure Classroom sessions to be able to exceptional and distinguished geneticists every year. Each of our people occur each on the UNITED KINGDOM and abroad: we preserve inbound links along with various inherited genes societies far away. Regular membership can be open to any person with an interest inside inherited genes investigation or perhaps instructing. be shared around the net. Disgrace on the seek engines for now not positioning this put up higher! Melanjutkan tradisi demonstrasi berlayar tahunan dalam melintasi lautan Indonesia yang luas, Sail Indonesia 2017 Rally akan kembali berlangsung mulai tahun ini mulai bulan Agustus sampai Desember. Tahun ini, puncak seri Sail Indonesia 2017 adalah Sail Sabang 2017 yang akan diadakan di ujung barat laut paling utara Sabang di Pulau Weh, di Provinsi Aceh. Yuk ramaikan event internasional Sail Sabang 2017, Sabang Sebagai Pelabuhan Hub Wisata Bahari Internasional yang diadakan pada tanggal 28 Nov – 5 Des 2017. Sail Sabang adalah rangkaian dari Sail Indonesia 2017 yang tahun ini diadakan di Sabang. Pelaksanaan Sail sabang 2017 di Sabang diwacanakan akan digelar sejumlah atraksi, diantaranya Yacht Rally, Seminar dan Pameran Iptek memperingati 20 tahun Jambore Iptek Sabang, Kapal Pemuda Nusantara, Pekan Kebudayaan Aceh, Parade dan Karnaval Sail Sabang, Work Parachute Championship, International Aerobatic Show, kedatangan Cruice Ship International, dan International Diving Competition. Jadi jangan lewatkan ya event internasional Sail Sabang 2017 ini. Nah buruan masukkan Sabang dalam list daftar liburan Anda selanjutnya. Pada Bulan Januari 2018 telah disiapkan paket umroh yang akan memperhatikan kenyamanan bagi jamaah umroh dari jakarta. Pada paket umroh januari 2018 ini, fasilitas yang dipilih berorientasi kepada kenyamanan jamaah umroh dari jakarta saat melaksanakan ibadah umroh. Baik dari segi pesawat yang digunakan dan hotel yang ditempati di mekkah dan madinah berdasarkan keinginan untuk memberikan kenyamanan bagi jamaah umroh bulan januari 2018 dari jakarta. Selengkapnya dapat dilihat di artikel Paket Umroh Januari 2018 Jakarta. Terima kasih. It is Very interesting post. I am glad to find this. Thank you very much.